Clitoral gland - Angiectasis in a female B6C3F1/N mouse from a chronic study. Variably sized and shaped channels are distributed throughout the clitoral gland. 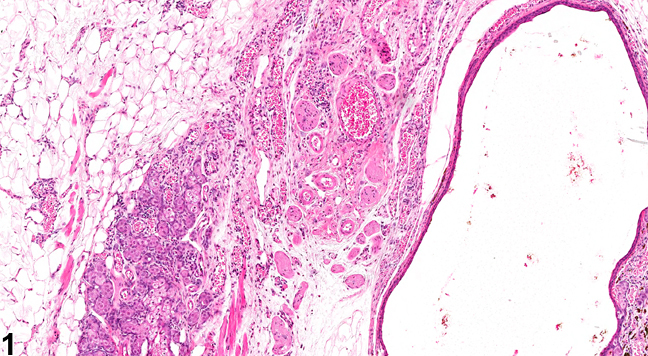 Clitoral gland - Angiectasis in a female B6C3F1/N mouse from a chronic study (higher magnification of Figure 1). Channels (arrows) are lined by flattened spindle cells and contain variable numbers of red cells. 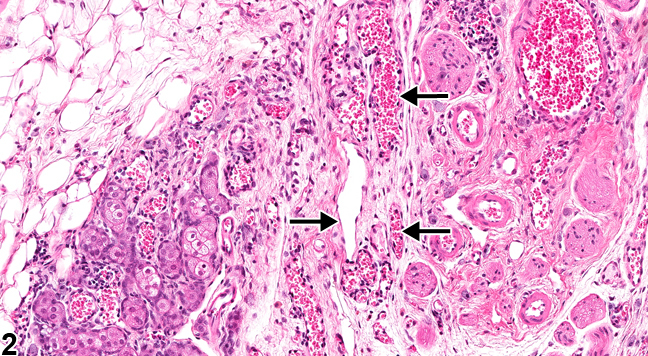 In angiectasis, preexisting clitoral gland blood vessels become dilated and filled with blood cells, accompanied by compression of the clitoral gland parenchyma ( Figure 1 and Figure 2 ). A distinction between angiectasis and hemangioma should be attempted, although the distinction is not always obvious. Hemangiomas tend to be well-circumscribed, unencapsulated masses composed of tightly packed, dilated vascular spaces. Each vascular space is enclosed and lined by a single layer of normal-appearing endothelial cells aligned on collagenous septa, which are usually thin, although some have broad collagenous stroma. Angiectasis does not usually present as a well-circumscribed mass: the dilated vascular channels often course irregularly through the tissue. Compression of adjacent parenchyma may occur in both angiectasis and hemangioma. Clitoral gland - Angiectasis should be diagnosed and graded whenever present. National Toxicology Program. 2003. NTP TR-509. Toxicology and Carcinogenesis Studies of 2,4-Hexadienal (89% trans,trans Isomer, CAS No. 142-83-6; 11% cis,trans Isomer) in F344/N Rats and B6C3F1 Mice (Gavage Studies). NTP, Research Triangle Park, NC.